There are millions of people who struggle with a chronic illness or disability in the Netherlands and approximately one third of them is unable to perform basic tasks due to their condition. Additionally, almost half of the Dutch chronically ill population feels isolated due to having an unsupportive social environment, meaning that they are misunderstood by the people around them. These statistics show that on a societal level, it is necessary to find a solution to increase understanding for people with a chronic illness. A tool that could be helpful is the use of persuasive games: a form of serious games that is designed to change the attitude of the player towards a certain subject. Four students from Auckland launched a game called Robin, which was created with the purpose of increasing awareness and understanding for one problematic symptom that many chronically ill people deal with: fatigue. The aim of this study is to determine what influences the judgment of players on Robin by picking two aspects that are related to this game, namely gaming background and experience with chronic illness. These players are placed in the role of amateur critics to get a new perspective on what is important in games like these, as they are the people that need to be persuaded by them. 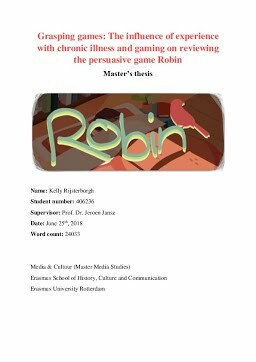 This resulted in the following research question: How do amateur critics’ gaming background and their experiences with chronic illness influence how they review the impact of the persuasive game Robin? A qualitative method has been chosen to perform the research, as it is focused on the experiences and perspectives of the participants. More specifically, qualitative interviews were found to be the most fitting approach for data gathering, as it gives the participants the chance to speak freely on what they find important. Two different groups of seven participants have taken the place of amateur critics, namely people with and without a chronic illness. Additionally, an expert interview was conducted with one of Robin’s developers, to see in what aspects the developers and the amateur critics differed in their views on features of the game. The results of this thesis show that experience with chronic illness is influential on the judgments of the amateur critics due to prior knowledge and the personal relevance in relation to the subject. Furthermore, the criticisms in their reviews were based on features that did not resemble their own lives, meaning that the amateur critics found it important to identify with the protagonist in order to feel more impacted by the game.